I know. The biggest guy on our team, "Big Greg", was under 200 lbs. Vitamins, steroid chicken and beef, and no shortage of food and supplements. You know Chechem I will take just one, Mt. Cody being as big as he was and dunking a BB. When I was in high school we only had 2 big boys who even made the BB team. RTR! Saw over on Woolly that Alabama made a scholarship offer to Chad Kelly (QB) from New York. Not yet confirmed on Rivals. I think our 3 loss year this past year was an anomaly. With all the talent we have and all the talent coming in, I don't see many more 3 loss years for a Saban coached Bama team. RTR! I agree. Even Les Miles could win with this talent. # Back at ya Chech. With Les' luck (and he is the luckiest coach I've ever seen), no telling how far he could go. From Winter Park, FL. This kid is big and fast (6'3" and 211). Just like me, only less weight. Watch him drag the defenders along on the last few clips on the video - look familiar? Guys, did you see my blog post about building out the recruiting section of the site? I don't know if people are even looking at the front page these days since all of the activity happens in the forum right now. No, sorry. I'll check it. I notice how many we have from GA. I think CNS may be taking over GA and Fla. in who he wants. I know we gave up some but SC and Ga was the only ones he lost last year. RTR! Just a few years ago we were lucky to get a visit from a player from Florida or Georgia. Now we've got a crowd every visit day. Times are good. Barry J. Sanders article/ ESPN. "I am most familiar and comfortable with Oklahoma State right now. I have been around that program so long. But I will say that it is a growing program and they are so close to getting to that next level. Coach [Mike] Gundy has done a great job. They improve each year, and I am keeping a close eye on them. "Alabama is a proven school with a great coach like Nick Saban. He knows what he's doing. I also know that that is a place that will get you ready for the next level." If my standards are not high enough, kindly lower yours. Re: Barry J. Sanders article/ ESPN. he University of Alabama officially extended a scholarship to dual-threat quarterback Chad Kelly on Thursday. 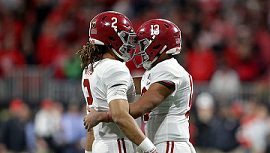 Kelly, the nephew of Pro Football Hall of Fame quarterback Jim Kelly, had been hearing from Alabama already, but his offer was made official when Crimson Tide head coach Nick Saban called Kelly directly to give him the news.